Protective circulating Abs originate primarily from long-lived plasma cells in the bone marrow. However, the molecular and cellular basis of plasma cell longevity is unknown. We investigated the capacity of primary bone marrow-derived stromal cells to maintain plasma cell viability in vitro. Plasma cells purified from the bone marrow or lymph nodes died rapidly when plated in media, but a subpopulation of plasma cells survived and secreted high levels of Ab for up to 4 wk when cocultured with stromal cells. Ab secretion was inhibited by the addition of anti-very late Ag-4 to plasma cell/stromal cell cocultures indicating that direct interactions occur and are necessary between stromal cells and plasma cells. The addition of rIL-6 to plasma cells cultured in media alone partially relieved the sharp decline in Ab secretion observed in the absence of stromal cells. 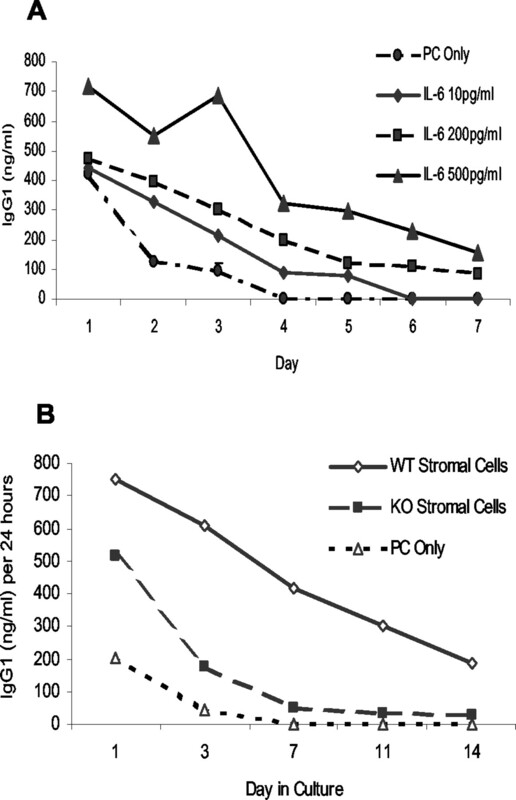 Moreover, when stromal cells from IL-6−/− mice were used in plasma cell/stromal cell cocultures, Ab levels decreased 80% after 7 days as compared with wild-type stromal cells. Further, IL-6 mRNA message was induced in stromal cells by coculture with plasma cells. These data indicate that bone marrow plasma cells are not intrinsically long-lived, but rather that plasma cells contact and modify bone marrow stromal cells to provide survival factors. The humoral branch of the immune system is critical for providing protective circulating Abs. In humans, Ag-specific Ab has been detected in the serum for decades after Ag encounter (1). However, because the half-life of circulating Ab is estimated to be <3 wk (2, 3, 4), the Ab pool must be constantly replenished to maintain serum Ab levels. The Ab pool is maintained by plasma cells, which continually secrete Abs. The fact that protective immunity is long-lasting, coupled with the short half-life of Abs, implies either that plasma cells are long-lived cells or that the plasma cell pool is continually replenished to maintain certain levels of secreted Ab. Evidence supporting the latter mechanism exists (5, 6, 7, 8, 9, 10), but recent studies strongly support the view that long-lived plasma cells provide much of the circulating Ab (11, 12). It is well-established that the bone marrow becomes a major site of Ab production (13, 14, 15, 16, 17, 18). In the past few years, it has become apparent that the population of plasma cells that exists in the bone marrow is long-lived (11, 12). This hypothesis is supported by a study in mice showing that Ag-specific bone marrow plasma cells survived >90 days postimmunization without turnover as assessed using bromodeoxyuridine labeling (11). This finding suggested that bone marrow plasma cells are not a dynamic dividing population, but instead are long-lived cells that constitutively produce Ab. Ag-specific bone marrow plasma cells have also been detected for >300 days post viral infection (12). In the same studies, plasma cells transferred to naive mice maintained serum Ab levels for >120 days posttransfer, confirming the idea that plasma cells elicited by a single Ag are long-lived and not a constantly replenished population. Manz et al. (19) found that immunization of naive recipients with the original immunogen did not affect Ab secretion rates from the transferred plasma cells, nor was necessary to maintain plasma cell longevity. Despite the important role of plasma cells, they make up a small percentage of the total cells in secondary lymphoid tissue and bone marrow (12). The small number of Ab-secreting cells in these tissues makes it difficult to isolate plasma cells for in vitro studies. To circumvent this problem, most studies have used myeloma cell lines or patient material. There are relatively few studies that have characterized terminally differentiated plasma cells or the marrow microenvironment that may support their longevity. One critical element of the bone marrow microenvironment is the bone marrow reticular stromal cell. Stromal cells provide growth factors as well as cell contact-dependent signals needed for hemopoiesis, including progression of B-lymphoid lineage cells in vivo and in vitro (20, 21, 22, 23, 24, 25). It is possible that stromal cells also support plasma cell survival. Although the role of stromal cells in the maturation of human plasmablasts into terminally differentiated plasma cells is supported by several studies (26, 27, 28, 29), the role of stromal cells in maintaining plasma cell longevity remains largely unexplored. The goal of the present study was to determine whether plasma cells need extrinsic components to survive and whether reticular stromal cells are able to support plasma cell longevity. As we recently described, E-selectin/P-selectin double-deficient mice (E/P−/−) (30, 31) represent a source of plasma cells that can be purified in sufficient quantities for in vitro studies (32). Plasma cells from E/P−/− mice exhibit classic morphology and phenotype of terminally differentiated plasma cells and do not proliferate (32). They appear similar to plasma cells isolated from wild-type mice (19). In this study, we demonstrate that primary bone marrow reticular stromal cells are able to sustain viability and Ab production by plasma cells isolated from either the lymph nodes of E/P−/− mice or from wild-type bone marrow for at least 4 wk. Further, both IL-6 and very late Ag (VLA)3-4 appear to have key roles in supporting plasma cell survival. Female BALB/c mice and female C57BL/6 and C57BL/6tmIL-6−/−kopf (IL-6−/−) (33) mice were purchased from Harlan Laboratories (Indianapolis, IN) and from The Jackson Laboratory (Bar Harbor, ME), respectively, at 4–5 wk of age. Female BALB/c mice were purchased from the National Institute of Aging (Bethesda, MD) at 22 mo of age. Upon receipt, the animals were housed at the Animal Research Facility (Loyola University Medical Center, Maywood, IL) under specific pathogen-free conditions. E/P−/− on the C57BL/6 background were originally provided by Dr. D. Bullard (University of Alabama, Birmingham, AL) and were bred and maintained at Northwestern University Medical School (Chicago, IL) (32). E/P−/− mice were used at 3–8 mo of age. Whitlock-type long-term bone marrow cultures that support B-lymphopoiesis (LTBMC-B) were initiated from pooled femoral and tibial bone marrow of BALB/c, C57BL/6+/+, or IL-6−/− mice 4–5 wk of age and maintained by established methods (34, 35). After 4–6 wk, stromal cells were FACS sorted (FACStarPlus; BD Biosciences, San Jose, CA) directly into flat-bottom 96-well plates at a density of 1 × 104 cells/well based on differential forward vs side scatter and the lack of uptake of 1,1′-dioctadecyl-3,3,3′,3′-tetramethylindo-carbocyanine percholate-labeled acetylated low-density lipoprotein (Biomedical Technologies, Stoughton, MA) as previously described (36). Plasma cells were isolated from E/P−/− cervical lymph node cells by depletion of cells expressing CD5, CD11b, IgM, or B220 using magnetic beads (Miltenyi Biotec, Auburn, CA) (32). A purity of >94% was achieved using this method. To isolate bone marrow plasma cells, a two-step isolation protocol was used. First, cells were purified based on CD138/Syndecan-1 expression using biotinylated anti-CD138/Syndecan-1 (281–2; BD PharMingen, San Diego, CA) (37) followed by an incubation with anti-biotin microbeads (Miltenyi Biotec). Because bone marrow plasma cells are present in low numbers, the column-isolated cells were stained with streptavidin-allophycocyanin (BD PharMingen) and further purified by FACS sorting for CD138+ cells. Aged BALB/c mice (22 mo old) were used because old mice have 10–20 times more plasma cells than young mice (∼1–5% of total bone marrow cells). Isolated plasma cells were placed onto slides by cytocentrifugation and stained with H&E to check for plasma cell morphology. More than 95% of cells with the morphology of differentiated plasma cells (small, dense, eccentric nucleus; prominent golgi; volumous cytoplasm; see also Fig. 1⇓) were achieved using this method. Maintenance of Ab secretion from plasma cells when cocultured with stromal cells. Plasma cells isolated from the cervical lymph nodes of E/P−/− mice (A) or the bone marrow of BALB/c mice (B) were cocultured with FACS-sorted stromal cells. Supernatants were collected from the cultures twice weekly and then assayed for the presence of IgG1 (A) or IgM (B) Ab by ELISA. Data in A are shown as the average ± SEM of six individual experiments. The results in B are from one representative experiment of two performed. Each experiment was performed from independent culture initiations for stromal cells and from independent plasma cell isolations. PC on SC, plasma cells cocultured with stromal cells; PC Only, plasma cells cultured in medium alone. ∗, p < 0.05. Photomicrographs: plasma cells from E/P−/− lymph nodes or the bone marrow of wild-type mice were isolated as described in Materials and Methods. Isolated plasma cells were placed onto slides by cytocentrifugation and stained with H&E. Freshly isolated plasma cells were added to FACS-sorted reticular bone marrow stromal cells at a density of 5 × 103 plasma cells/well with or without 104 stromal cells/well, as indicated, in a total volume of 150 μl. Supernatants (120 μl) were collected twice weekly and fresh media was added after supernatant collection. In experiments using IL-6, recombinant mouse IL-6 (rmIL-6) (BD PharMingen) was added as indicated at the initiation of culture and during each medium change at the specified concentrations. The following monoclonal blocking Abs were used: M/K2 (anti-CD106/VCAM-1, protein G purified; American Type Culture Collection, Rockville, MD), PS2 (anti-CD49d/VLA-4, protein G-purified; American Type Culture Collection), and KM81 (anti-CD44/phagocytic gp-1, provided by Dr. M. Seigelman, University of Texas Health Science Center, Dallas, TX). The ability of these Abs to block adhesion was tested in our laboratories. Briefly, the ability of anti-VCAM-1 and anti-VLA-4 to displace B cell precursors from the adherent layer in LTBMC-B was tested as described by Miyake et al. (38). Adding our Abs to the cultures at 5 μg/ml was sufficient to release 81.6 and 73.68% of the lymphocytes, respectively, from the adherent layers. Additionally, our anti-CD44 at 5 μg/ml was sufficient to inhibit hyaluronic acid binding to BW5147 cells by 100% (39). Blocking Abs were added at this concentration (5 μg/ml) to the plasma cell/stromal cell cocultures at the initiation of coculture and during each medium change. Isotype-matched control Abs were purchased from BD PharMingen and added to control cocultures (5 μg/ml). Freshly isolated plasma cells cultured in the presence or absence of rmIL-6 were harvested and fixed in 100 μl 1× PBS, 100 μl heat-inactivated FBS, and 600 μl 70% ice-cold ethanol for 60 min at 4°C. The cells were washed twice and stained with 0.5 mg/ml propidium iodide (PI; Sigma-Aldrich, St. Louis, MO) with 0.1 mM EDTA and 0.05 mg/ml RNase A (Calbiochem, La Jolla, CA) for at least 1 h at room temperature before FACS analysis. Gates were set based on control lymphocyte samples stained in parallel and on the natural cellular population breaks. Samples were analyzed using CellQuest software. Additionally, freshly isolated plasma cells were cultured for 48 h in medium supplemented with 30 μg/ml BrdU (Sigma-Aldrich) and in the presence or absence of rmIL-6. After 48 h, the cells were harvested and stained according to the manufacturer’s suggested protocol (BD PharMingen). BrdU incorporation was determined by flow cytometry analysis using Cell Quest software. Isotype-specific ELISAs were modified from previous descriptions (40). Supernatants collected at the indicated time points were frozen at −20°C until analyzed by ELISA and were added undiluted or prediluted 1/2 or 1/4. Biotin-conjugated rat anti-mouse isotype-specific Abs were used at 1 μg/ml for detection and were developed with streptavidin-conjugated alkaline phosphatase (Southern Biotechnology Associates, Birmingham, AL) and p-nitrophenyl phosphate (Sigma-Aldrich). Two-fold serial dilutions of isotype-specific standards were included on every test plate at a range of 1000–1.92 ng/ml. Samples were analyzed by quantitating values within the linear range of the standard curve. The upper and lower limit of detection ranged from 1000–500 ng/ml to 1.92–7.8 ng/ml, respectively, in each assay. No Ab was detected in the supernatants from stromal cells cultured in the absence of plasma cells. The following ELISA Abs were purchased from BD PharMingen: unlabeled rat anti-mouse IgG1 (A85-3), unlabeled rat anti-mouse IgM (II/41), purified mouse IgG1 (A112-2), purified mouse IgG2a (G155-178), purified mouse IgG2b (MPC-11), purified mouse IgG3 (A112-3), purified mouse IgM (G155-228), biotin-conjugated rat anti-mouse IgG1 (A85-1), biotin-conjugated rat anti-mouse IgG2a (R19-15), biotin-conjugated rat anti-mouse IgG2b (R12-3), biotin-conjugated rat anti-mouse IgG3 (R40-82), and biotin-conjugated rat anti-mouse IgM (R6-60.2). Additionally, unlabeled donkey anti-mouse IgG was purchased from Jackson ImmunoResearch Laboratories (West Grove, PA). Plasma cells cultured in medium alone were harvested from individual wells, pooled, and the numbers of viable cells were determined by trypan blue exclusion. Total plasma cells present in cocultures were enumerated by immunofluorescence microscopy for the presence of intracellular Ig L chain. Plasma cells and stromal cells were harvested from wells at days 1, 3, 7, and 14. Four wells per time point were pooled and placed onto slides by cytocentrifugation. Cells were fixed and permeabilized, then stained with FITC-R26-46 (anti-Igλ) and FITC-R5-240 (anti-Igκ) purchased from BD PharMingen. At least 1000 cells were counted by phase microscopy for each slide and the number of FITC+ cells were determined for each enumerated field using a Leitz Diaplan fluorescent scope (W. Nuhsbaum, Inc., McHenry, IL). The frequency of plasma cells per time point was determined by dividing the total number of FITC+ cells by the total number of cells counted by phase microscopy. IgG1-specific ELISPOTs were modified from previous descriptions (41). Plates were blocked with 1× PBS/1% BSA (Sigma-Aldrich) for a minimum of 4 h at room temperature. Plasma cells were harvested from stromal cell cocultures and incubated on the plates overnight at 37°C. Samples were serially diluted 1/3 and run in duplicate or triplicate. Bound Ab was detected and plates were developed and read as described previously (39). Abs used for the ELISPOT assay were the same as those described above for Ig-specific ELISAs. Peroxidase-conjugated streptavidin was purchased from BD PharMingen. RNA was isolated individually from plasma cells and stromal cells in cocultures. To release the plasma cells from the stromal cell adherent layer, cultures were treated with 0.02% EDTA. Stromal cells were lysed directly in the wells and the lysate was collected for RNA isolation. RNA was isolated from both cell types using the Qiagen RNeasy kit (Valencia, CA) according to the manufacturer’s protocol. cDNA was synthesized using the Applied Biosystems PCR Core kit (Branchburg, NJ). Real-time PCR analysis of IL-6 message was performed on a GeneAmp 5700 sequence detection system (Applied Biosytems). Platinum QPCR Supermix-UDG (Life Technologies, Grand Island, NY), 12.5 μM Rox reference dye (Life Technologies), SYBRGreen DNA binding dye diluted 1/2000, forward and reverse primers (2.5 μM in 10 mM Tris), UV-treated double-distilled H2O, and appropriate standard cDNA or sample cDNA were added to each sample. RNA isolated from the stromal cell line BMS2 (gift of P. Kincade, Oklahoma Medical Research Foundation, Oklahoma City, OK) stimulated with 25 μg/ml cyclohexamide and 10 μg/ml LPS was used as a positive control. Negative controls included samples without reverse transcriptase or RNA or cDNA. Controls, standards, and samples were run in triplicate (20 μl volume) in a 96-well optical reaction plate and capped with optical caps (Applied Biosystems). Real-time oligonucleotides were designed using Primer Express software (Applied Biosystems) and purchased from Integrated DNA Technologies (Coralville, IA) and Life Technologies: IL-6 5′ primer, TGTATGAACAACGATGATGCACTT; IL-6 3′ primer, ACTCTGGCTTTGTCTTTCTTGTTATCT; GAPDH 5′primer, GTGAGGCCGGTGCTGAGTAT; GAPDH 3′ primer, TCATGAGCCCTTCCACAATG. The real-time PCR thermal cycler profile was run as follows: one cycle at 50°C for 2 min, one cycle at 95°C for 10 min, 40 cycles of denaturing at 95°C for 15 sec, and annealing and elongation at 60°C for 1 min, followed by a dissociation protocol run to test the melting temperature of the product. The data was analyzed using GeneAmp 5700 SDS software (Applied Biosystems). In each experiment, plasmids containing the GAPDH or IL-6 PCR product were used to generate a standard curve to calculate the number of copies of transcript per microliter. The standards were 10-fold serial dilutions ranging from 1 × 105 to 1 × 102 copies/μl. IL-6 mRNA expression levels for each sample were calculated by determining the ratio of the number of IL-6 copies per microliter to the number of GAPDH copies per microliter. Data are presented as the fold-difference of IL-6 expression for each sample as compared with the control samples with only stromal cells. In some experiments, the relative amount of IL-6 mRNA message was assessed by semiquantitative RT-PCR followed by Southern blot of the RT-PCR products. RNA was isolated and cDNA synthesized as described above. Subsequent PCR analysis was performed using the manufacturer’s suggested protocol and a GeneAmp 2400 thermacycler (PerkinElmer, Wellesley, MA). Primer oligonucleotides were synthesized by Integrated DNA Technologies: IL-6 5′ primer, ATGAAGTTCCTCTCTGCAAGAGAC and IL-6 3′ primer, CACTAGGTT TGCCGAGTAGATCTC as reported by Van Snick et al. (42); β-actin 5′ primer, GTGGGGCGCCCCAGGCACCA and β-actin 3′ primer CTCCTTAATGTCACGCAC GATTTC. DNA was transferred to a Duralose-UV membrane (Stratagene, La Jolla, CA) and cross-linked with a UV stratalinker. The BMS2 IL-6 PCR product was used as the probe template and primed with random hexamers to produce a [32P]dCTP-labeled probe (Stratagene). The blot was washed for 10 min at room temperature in 2× SSC and 0.1% SDS, followed by a 60-min wash at 60°C. Signals were visualized and quantified using a Typhoon 8600 PhosphorImager (Molecular Dynamics, Sunnyvale, CA). β-Actin PCR products were stained for 30 min with Vistra Green diluted 1/105 in TE (Amersham Biosciences, Piscataway, NJ) and visualized using the Typhoon 8600 Fluorimager (Molecular Dynamics). Quantitation was performed using ImageQuant software (Molecular Dynamics). Statistical significance between the experimental groups was determined using a paired Student t test; p ≤ 0.05 was considered significant. Reticular stromal cells form the cellular scaffold of the bone marrow and are important for supporting hemopoiesis. Because stromal cells are especially important for the maintenance of early B-lineage cells, the ability of bone marrow stromal cells to enhance plasma cell survival was evaluated. Continued Ab secretion was used as a means of assessing plasma cell survival. The E/P−/− plasma cells secreted predominantly IgG1 Ab (Table I⇓) (32). Therefore, IgG1 was used to assess plasma cell viability in all subsequent experiments with E/P−/− plasma cells. When plasma cells from E/P−/− lymph nodes were cultured in the absence of a stromal cell layer, the level of secreted Ab was sharply reduced at time points as early as 24 h, compared with plasma cells cultured with stromal cells, and by day 11 little or no Ab could be detected (Fig. 1⇑A). Specifically, no Ab was detected at day 7 in two of five experiments, and by day 11 average Ab levels were 5 ng/ml for all five experiments. 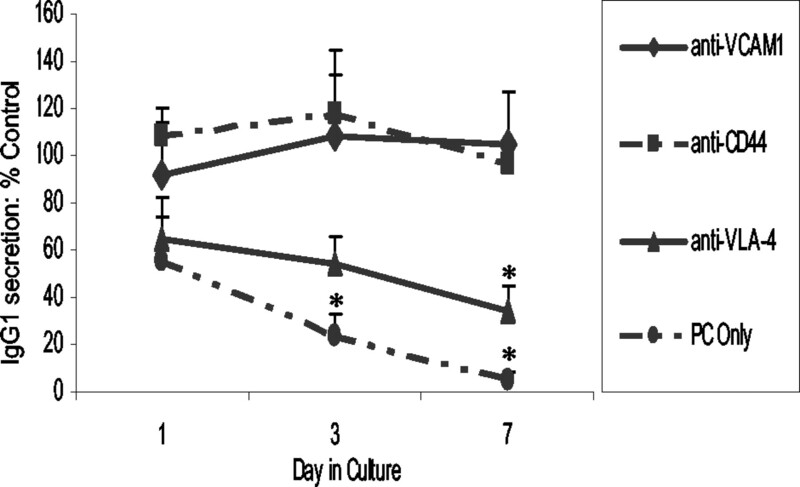 In contrast, much higher levels of Ab were detected in the plasma cell/stromal cell coculture supernatants for the first ∼3 days, followed by a significant drop by day 7. Ab levels then fell gradually over the next 3 wk. Levels of IgG2a or IgG2b Ab followed a similar course indicating that the loss of IgG1 Ab was not due to selective loss of this isotype or due to isotype switch (data not shown). These results indicate that bone marrow stromal cells can maintain plasma cell viability and Ab secretion. Recent studies by both Slifka et al. (12) and Manz et al. (11) suggest that the majority of long-lived plasma cells reside in the bone marrow. Plasma cells isolated from either bone marrow of wild-type mice or the lymph nodes of E/P−/− mice were morphologically similar (Fig. 1⇑), but the bone marrow plasma cells secreted primarily IgM. Despite the difference in the secreted Ab isotype, a similar pattern of survival was observed between lymph node and bone marrow plasma cells. When bone marrow plasma cells were cultured without stromal cells, Ab secretion declined quickly, falling to undetectable levels by day 11 (Fig. 1⇑B). Conversely, when bone marrow plasma cells were cocultured with stromal cells, higher levels of Ab were observed, and Ab was still detectable 3 wk after culture initiation. The pattern of decline of bone marrow plasma cells was also similar to E/P−/− plasma cells, with most of the plasma cell loss occurring early during culture. These data suggest that the plasma cells from E/P−/− or wild-type mice are comparable and that stromal cells are able to prolong plasma cell longevity of plasma cells from the two tissues similarly. To evaluate the frequency of plasma cells present in cocultures with stromal cells, plasma cells were enumerated at various time points using trypan blue exclusion, immunofluorescence microscopy for the presence of intracellular L chains, or by ELISPOT assay for IgG1. When plasma cells were cultured in the absence of stromal cells, their numbers decreased rapidly, falling to zero by day 7 as determined by trypan blue exclusion. Viable plasma cells were detected after day 7 only when plasma cells were cocultured with stromal cells. Using immunofluorescence microscopy, the frequency of intracellular IgL+ cells in plasma cell/stromal cell cocultures decreased by 64% after 3 days, an additional 23% after 7 days, followed by an 11% decrease after 2 wk (Table II⇓). The total frequency of plasma cells after 2 wk in culture with stromal cells was ∼2% of the original input of 5000 plasma cells at day 0, yet the remaining cells continued to secrete relatively high levels of Ab. In separate experiments, the frequency of IgG1-specific plasma cells as determined by ELISPOT assay followed a similar trend: an 89% decrease observed at day 3, an 88% decrease at day 7, and a 99.7% decrease after 2 wk (Table II⇓). Taken together, these data suggested that the decreased amount of Ab in the supernatants corresponded to a decrease in the number of Ab-secreting cells, rather than decreased Ab production from a large population of surviving cells. Thus, a small population of plasma cells exhibits extended longevity in the presence of stromal cells, and further, maintains their full capacity to secrete Ab. Whether this process is stochastic or whether these stromal cells select for a subpopulation of plasma cells is not clear. To determine whether plasma cell survival is dependent on contact with stromal cells, the requirement for stromal cell/plasma cell binding through specific adhesion molecules was tested. The adhesion molecules VLA-4 and CD44 are expressed and active on the surface of E/P−/− plasma cells (32), and their ligands VCAM-1 and hyaluronate are found on the surface of stromal cells from LTBMC-B (38, 43). Addition of anti-CD44 or anti-VCAM-1 had little or no effect on Ab secretion (Fig. 2⇓). In contrast, addition of anti-VLA-4 resulted in a 40% decrease in Ab secretion after only 24 h, a 50% decrease after 3 days, and 70% by 7 days as compared with cultures that received no blocking Abs. These data indicate that VLA-4 on the plasma cell surface is important for adhesion to stromal cells and consequent plasma cell survival. Because the addition of anti-VCAM-1 had no effect on Ab secretion, VLA-4 may bind stromal cells via another ligand, such as fibronectin. IgG1 secretion from plasma cells cultured with anti-adhesion molecule Abs. Plasma cells were cocultured with FACS-sorted stromal cells in the presence or absence of blocking Abs to VCAM-1, CD44, or VLA-4 (5 μg/ml). Supernatants were collected and pooled from wells twice weekly and IgG1 Ab secretion was assayed by ELISA. Data are expressed as the percentage of IgG1 secretion as compared with plasma cells cocultured with stromal cells in the absence of blocking Abs. Data shown are the average of two independent experiments with anti-CD44 and anti-VCAM-1, and three independent experiments with anti-VLA-4 ± SEM. ∗, p < 0.05 as compared with plasma cells cocultured with stromal cells in the absence of blocking Abs. Data for cocultures receiving anti-VLA-4 was not statistically significant from plasma cells cultured in medium alone. PC Only, plasma cells cultured in medium alone. Several studies performed with normal and malignant human plasma cells suggest that IL-6 is necessary for survival of human plasma cells and myeloma cells (44, 45). We predicted that if IL-6 is important for maintaining murine plasma cell survival in the bone marrow, then plasma cell survival would be enhanced when exogenous IL-6 is added to plasma cells cultured without stromal cells. To test this premise, Ab secretion was monitored after the addition of varying concentrations of rmIL-6 (Fig. 3⇓A). The plasma cells did not constitutively make endogenous IL-6, which was determined by the addition of neutralizing Ab to IL-6 and by real-time PCR (data not shown and Fig. 4⇓). The addition of exogenous rmIL-6 maintained Ab secretion in a concentration-dependent manner. Ab was not detected after 4 days in wells with medium only, while Ab was still detectable at day 7 in wells that received rmIL-6. Because IL-6 can stimulate the proliferation of many cell types, we determined whether the elevated levels of Ab observed were due to IL-6-induced proliferation. Cell cycle analysis was performed on plasma cells cultured in the presence or absence of rmIL-6 for 48 h using PI. No significant changes were detected in the proportion of plasma cells in the S or G2/M phases of cell cycle at any concentrations of rmIL-6 (Table III⇓). The lack of IL-6-induced proliferation was further confirmed by adding BrdU to the cultures at day zero. No BrdU was incorporated during the 48-h culture in the presence or absence of exogenous IL-6 (data not shown). Notably, the relative number of apoptotic events were markedly decreased when plasma cells received ≥500 pg/ml rmIL-6 (Fig. 3⇓B). Therefore, the data suggest that the elevated levels of Ab observed when rmIL-6 was added was due to increased plasma cell survival and possibly also increased Ab secretion per cell, but not due to increased cell number. IL-6 is necessary for plasma cell viability. A, The effects of exogenous IL-6 on plasma cell survival in the absence of stromal cells. Plasma cells were cultured in the absence of an adherent cell layer and received increasing concentrations of exogenous rmIL-6 at the initiation of culture. Supernatants were collected daily, pooled, and analyzed for the presence of IgG1 Ab. Exogenous rmIL-6 was reintroduced into the cultures when supernatants were collected. Data is shown as one representative experiment of two or three independent experiments for each concentration of exogenous rmIL-6. PC Only, plasma cells cultured in medium alone. 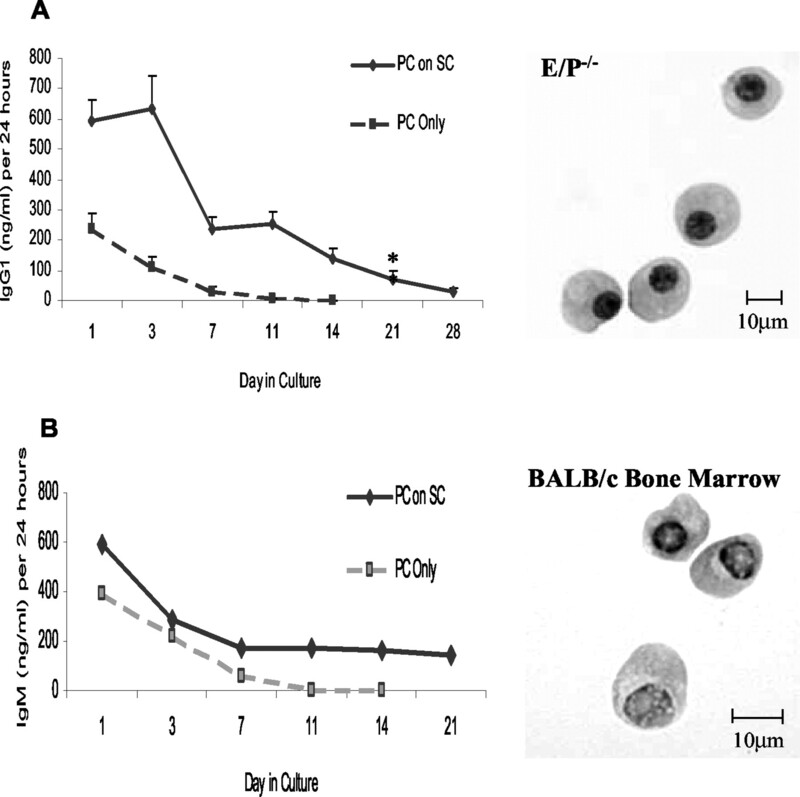 B, Maintenance of Ab secretion after coculture with stromal cells from IL-6−/− bone marrow. Plasma cells were cocultured alone or with a FACS-sorted population of stromal cells obtained from wild-type or IL-6−/− mice. Supernatants were collected and pooled from wells twice weekly and IgG1 Ab secretion assayed by ELISA. Data shown is one of three independent experiments. Two of three experiments exhibited the sharp decline in Ab secretion after 24 h as noted in the text; in one experiment Ab secretion was decreased by ∼10% at 24 h, but diminished quickly thereafter. By days 7 and 14, Ab secretion declined to similar levels in all three experiments performed. Induction of IL-6 mRNA in stromal cells after coculture with plasma cells. A, Stromal cells were FACS-sorted from LTBMC-B and cocultured with plasma cells. At 48 h of coculture, plasma cells were removed from the stromal cells and RNA was isolated separately from each cell population. IL-6 mRNA levels were measured using real-time PCR. A standard curve was used to determine the number of copies per microliter for each sample. IL-6 mRNA levels for each sample were calculated by normalizing the number of copies of IL-6 to the number of copies of GAPDH. The fold-difference in IL-6 mRNA was determined by dividing the normalized IL-6 value for each sample by the normalized IL-6 value for stromal cells cultured alone. B, In a separate experiment, IL-6 RT-PCR products were analyzed by Southern blot using the BMS2 IL-6 PCR product as the probe template. Signals were visualized and quantified using a Typhoon PhosphorImager. β-Actin PCR products were visualized using a Typhoon 8600 Fluorimager after a 30-min stain with Vistra Green. Lane 1, stromal cells alone; lane 2, plasma cells from coculture; lane 3, stromal cells from coculture; lane 4, no template; lane 5, no reverse transcription; lane 6, blank; lane 7, BMS2 cell line (positive control). IL-6 mRNA message levels from stromal cells from coculture are 16 times greater than plasma cells from coculture; β-actin mRNA message levels from stromal cells or plasma cells from coculture are three times greater than SC alone. The data in Fig. 3⇑A suggest that the addition of exogenous rmIL-6 can enhance plasma cell survival. To determine whether stromal cells provide IL-6 necessary for plasma cell longevity, plasma cells were cocultured with primary bone marrow reticular stromal cells from wild-type or IL-6 −/− mice (Fig. 3⇑B). As early as 24 h, the amount of detectable Ab was reduced by ∼33% in the supernatants from plasma cells cocultured with IL-6−/− stromal cells as compared with plasma cells cultured with wild-type stromal cells. Secretion continued to decrease rapidly in cocultures with IL-6−/−stromal cells, declining to levels 85% of that detected in cocultures with wild-type stromal cells at the end of the first week. Ab levels from cocultures with IL-6−/− stromal cells continued to remain at this low level through day 14. This data suggests that IL-6 is an essential factor for plasma cell survival and that IL-6 is provided to plasma cells by stromal cells. Although the decline in Ab levels observed in the IL-6−/− stromal cell cultures was significant as compared with wild-type stromal cell cultures, it was not as dramatic as that observed when plasma cells were cultured in the absence of stromal cells. In the latter cultures, Ab was virtually undetectable by the end of the first week. This suggests that the presence of other stromal cell-specific factors may be more important than IL-6 in the first 72 h of culture. The data in Fig. 3⇑ suggested that plasma cells respond to IL-6 provided by the stromal cells. However, previous studies in our lab showed that the primary cultured stromal cells from LTBMC-B do not constitutively secrete IL-6 (determined by ELISA, data not shown) or express IL-6 mRNA (Fig. 4⇑ and Ref. 35). To determine whether IL-6 mRNA was induced in stromal cells upon contact with plasma cells, IL-6 mRNA levels in stromal cell cultures with and without plasma cells were compared using quantitative real-time PCR. As shown in Fig. 4⇑A, IL-6 mRNA was increased 22-fold in stromal cells 48 h after plasma cells were added to the culture as compared with stromal cells alone. No change in IL-6 mRNA was observed in plasma cells removed from stromal cell/plasma cell cocultures, indicating that IL-6 was induced only in the stromal cells. Similarly, when IL-6 mRNA levels were assessed by conventional RT-PCR and Southern blot, IL-6 mRNA was only detected when stromal cells were cocultured with plasma cells (Fig. 4⇑B). No IL-6 was detected in RNA isolated from stromal cells cultured alone. Thus, contact with plasma cells may deliver a signal to the stromal cells that mediates changes in gene expression and function of the stromal cell. It is well-established that the majority of long-lived plasma cells reside in the bone marrow, an environment that promotes their terminal differentiation and fosters their survival (11, 12, 13, 14, 15, 16, 17, 18). In the current study, we addressed whether primary cultured bone marrow reticular stromal cells are sufficient to promote plasma cell longevity and maintain Ab secretion, and the mechanisms by which this occurs. Plasma cells isolated from the lymph node of E/P −/− mice appear to be a relevant model for studying plasma cell survival in vitro and appear phenotypically similar to wild-type plasma cells. The plasma cells are in the G0/G1 phase of cell cycle suggesting that they are terminally differentiated. In addition, their cell surface phenotype (CD138/Syndecan-1+, CD44+, CD19−, MHC II−, surface Ig−, CD11b/Mac-1−) and morphology resemble that of plasma cells isolated from bone marrow of wild-type mice (Refs. 19 , 32 , and 46 ; Fig. 1⇑). We found that primary bone marrow stromal cells could maintain the viability of a subset of plasma cells, whether obtained from lymph nodes of E/P−/− mice or bone marrow of wild-type mice. In contrast, plasma cells cultured in media without stromal cells or exogenous growth factors die rapidly, suggesting that plasma cell longevity is not an intrinsic quality (47). Further, this finding shows that the ability of stromal cells to support plasma cell viability is independent of both the tissue source and the isotype of the plasma cells. However, the patterns obtained with the two coculture systems are not completely identical. The amount of Ab secreted by bone marrow plasma cells cultured with stromal cells stabilizes after 1 wk, whereas the amount of Ab secreted by E/P−/− plasma cells continues to decline gradually over the same time period. Notably, studies performed with human plasma cells showed there are distinct differences in the cell surface phenotypes and in the requirements for growth factors of Ab-secreting cells isolated from tonsils, blood, or bone marrow (48, 49). More recently, a study by Medina et al. (50) confirmed that the cell surface phenotypes of Ab-secreting cells isolated from tonsils, peripheral blood, and bone marrow are heterogeneous in nature suggesting that the stages of maturity increase from tonsil to blood to bone marrow. Therefore, it is possible that bone marrow plasma cells are intrinsically longer lived than E/P−/− plasma cells derived from lymph nodes, perhaps as a result of terminal differentiation and conditioning in the bone marrow microenvironment, or by having a higher fraction of cells committed to long-term survival. The patterns of plasma cell viability in stromal cell cocultures are striking and consistent. Ab levels drop rapidly during the first week and then much more gradually or not at all during the remaining 2–3 wk of culture, suggesting that the majority of plasma cells die rapidly even in the presence of stromal cells. Several possible factors may underlie the survival of only a subset of plasma cells. There is a paucity of information on the components necessary for the survival of terminally differentiated plasma cells. A recent study by Sze et al. (47) showed that long-lived plasma cells appear not to develop from one specific pathway, but rather are derived from a heterogeneous population of cells. The data suggest that the lifespan of plasma cells is not controlled intrinsically, but rather by signals received from the external environment. To that note, plasma cell survival may require other cells or factors present in the bone marrow microenvironment in addition to the stromal cells used in this study. Alternatively, the relevant stromal cells may represent only a fraction of those used in our cocultures and may be limiting in these experiments. Plasma cell survival may also be limited in part by the life of the stromal cells themselves or the ability of stromal cells to maintain their ability to support plasma cell viability, although this clearly cannot account for all the observed plasma cell death. Additionally, the plasma cells present at the end of the fourth week of coculture may simply be the most recently differentiated plasma cells. Finally, and perhaps most physiologically, the death of the majority of plasma cells may reflect the normal process of homeostasis in the immune system, in which the majority of recently generated effector cells die, leaving only a small subpopulation to contribute to immunologic memory. These various possibilities are currently under investigation in our laboratories. The present studies also strongly suggest that IL-6 is crucial for plasma cell viability and Ab secretion. The addition of exogenous rIL-6 to plasma cells cultured without stromal cells results in increased longevity that is concentration-dependent. However, this action of IL-6 alone is weaker than stromal cells, because Ab levels still decrease more quickly than those from plasma cell/stromal cell cocultures (compare Figs. 1⇑A and 3A). Although the concentration used in these experiments is greater than reported circulating levels of IL-6 (51), it is difficult to mimic the local concentration of IL-6 produced by stromal cells when they are in close contact with plasma cells in the bone marrow microenvironment. In addition, IL-6−/− stromal cells are substantially impaired in their ability to support plasma cell viability and Ab secretion. Taken together, these results strongly imply that IL-6 is critical for plasma cell viability. However, because Ab secretion was not completely abrogated in IL-6−/− cultures containing IL-6−/− stromal cells, other factor(s) may be involved in plasma cell survival or can partially compensate for the absence of IL-6. Consistent with this, IL-6−/− mice exhibit reduced but not absent humoral responses to viral infection (33, 52). Whether plasma cell development or longevity per se is impaired in IL-6−/− mice is unknown. Previous studies in our laboratory show that primary cultured stromal cells do not constitutively secrete IL-6 in the absence of a stimulus (35). Rather, our findings suggest that IL-6 is produced as a result of a direct physical interaction between stromal cells and plasma cells. We found, by real-time PCR, that stromal cells are induced to transcribe IL-6 mRNA within 48 h of coculture with plasma cells but that little or no IL-6 mRNA is detected in cultures of isolated stromal cells or purified plasma cells. Whether IL-6 induction in stromal cells is a result of signals transduced as a consequence of plasma cell/stromal cell contact or from signals received from plasma cell-secreted proteins remains to be determined. However, the decrease in Ab secretion observed in the IL-6−/− stromal cell/plasma cell cocultures during the first week is similar to that observed in cocultures that received anti-VLA-4, implying that IL-6 induction in stromal cells is adhesion-dependent. It will be interesting to test whether blocking VLA-4 interaction with the stromal cell can influence IL-6 expression. B cell lymphopoiesis in Whitlock-type LTBMC-B requires lymphocyte/stromal cell interactions mediated both by VLA-4/VCAM-1 interactions and CD44/hyaluronate interactions (38, 43, 53, 54). We found that the addition of blocking Abs directed against VLA-4, but not VCAM-1 or CD44, result in decreased Ab secretion from plasma cells. These findings distinguish plasma cell/stromal cell interactions from pro-B cell/stromal cell interactions and suggest that plasma cell/stromal cell interactions via VLA-4 are important for plasma cell survival. The importance of VLA-4 interaction with its ligand VCAM-1 has been demonstrated for myeloma cell survival, hemopoiesis, and hemopoietic cell retention within the bone marrow (23, 55, 56, 57, 58, 59). In contrast, inhibiting contact with anti-VCAM-1, a ligand for VLA-4, has no effect on Ab secretion in our coculture system, suggesting that VLA-4 may interact with fibronectin or another unidentified ligand on stromal cells. The interaction of VLA-4 with fibronectin has been demonstrated with human CD38+ cells, which include plasma cells and their precursors (60). Understanding the mechanism by which protective immunity is maintained is important for developing more efficient therapies to induce long-term protective immunity. The goal in this study was to determine the basic mechanism for promoting plasma cell longevity. We found that bone marrow stromal cells are sufficient to maintain the survival of a small population of plasma cells for at least 4 wk. Elements necessary to maintain plasma cell survival include the adhesion through VLA-4 and the induction of IL-6 in the stromal cells. Future studies using this experimental system should allow further dissection of critical components and events necessary for plasma cell survival as well as the further elucidation of the role of bone marrow stromal cells in maintaining plasma cell longevity. We thank Kirstin Parkin and Kara Johnson for critical reading of the manuscript and helpful discussions, Dr. Phong Le for designing IL-6 real-time PCR primers, and Dr. Joseph Brewer for help with the Southern blots. Zheng Yu, Jeannette Pifer, David You, and Thomas Keech provided excellent technical assistance. We also thank Patricia Simms, Dr. Tom Ellis, and the Loyola FACS Core Facility for assistance with the cell sorting. ↵1 This work was supported by National Institutes of Health Grants RO1AG13874 and K07AG00997 (to P.L.W.) and HL58710 (to G.S.K.). H.A.M.W. was supported in part by National Institutes of Health Training Grant T32AI07508 and the Schmitt Dissertation Fellowship. ↵3 Abbreviations used in this paper: VLA, very late Ag; rmIL-6, recombinant mouse IL-6; LTBMC-B, long-term bone marrow culture for B-lineage; PI, propidium iodide; BrdU, 5′-bromo-2-deoxyuridine.